The Aimco team at the Brooklyn War Memorial, including Patti Shwayder, Aimco’s SVP of Government Relations and Communications. The Capalino+Company Corporate Social Responsibility group is proud to celebrate our client, Aimco, on their commitment to New York City’s veteran community. As a real estate investment trust focused on the ownership and management of quality apartment communities in the United States, Aimco has a long history of supporting veterans nationally. Capalino+Company has been working with Aimco to find ways to assist veterans in New York City, where they own 775 apartments in Chelsea, Harlem, the Upper West Side, and the Upper East Side. 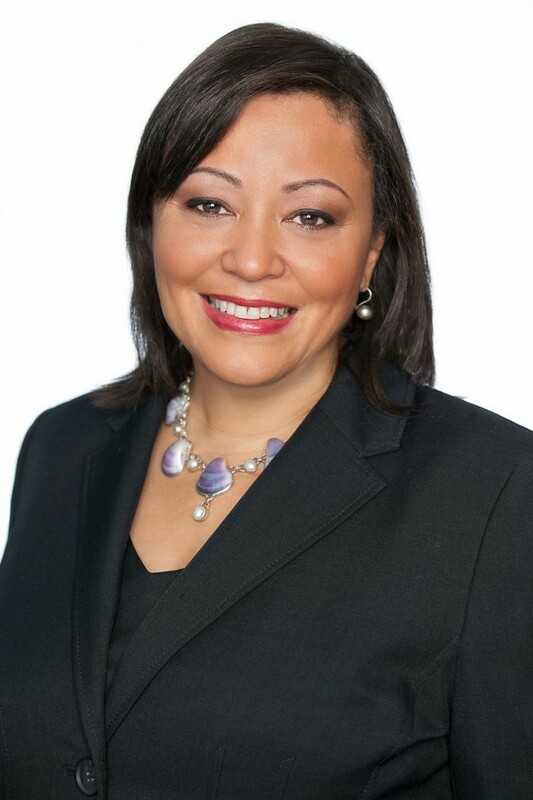 The Capalino+Company CSR team, led by Executive Vice President Jeanne Mullgrav, analyzed Aimco’s current giving and Corporate Social Responsibility profile to create a series of recommendations for activities and ways that Aimco could give back to the New York City veteran community. This year, Aimco gave its employees five hours of paid time off to volunteer on Veterans Day with veterans organizations in addition to 10 hours to volunteer during Aimco’s week of service. 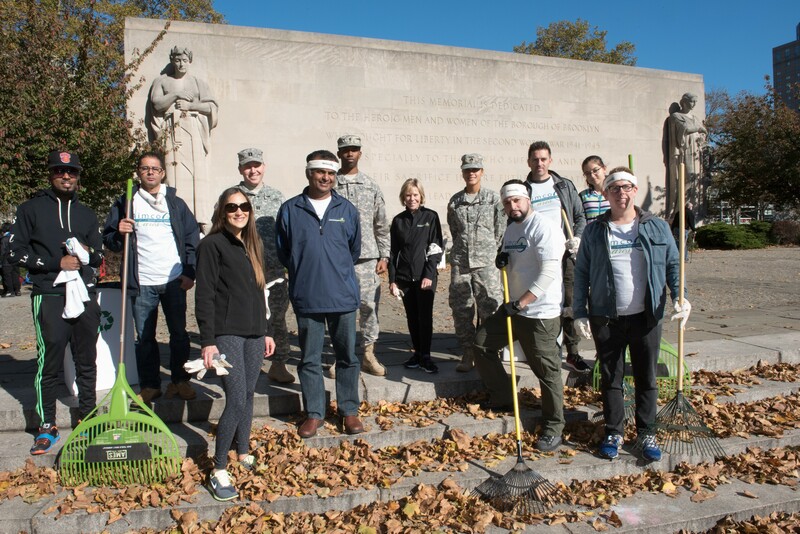 The Capalino+Company team set up different activities for Aimco employees to leverage their skills and time for NYC veterans: the first, a volunteer day with The Mission Continues to beautify the Brooklyn War Memorial, a tribute to veterans of World War II in which 11,500 Brooklyn residents died serving their country. Since the memorial is not ADA accessible, The Mission Continues organized this beautification project to continue to bring attention to the need for funding to allow the memorial to be accessible and open to veterans and their families. Aimco volunteers cleaned, raked, and planted daffodils in memory of the Brooklyn veterans who died in WWII. Capalino+Company Special Projects Strategist, Safeena Mecklai, with the Aimco team at the 2015 New York City Veterans Day parade. 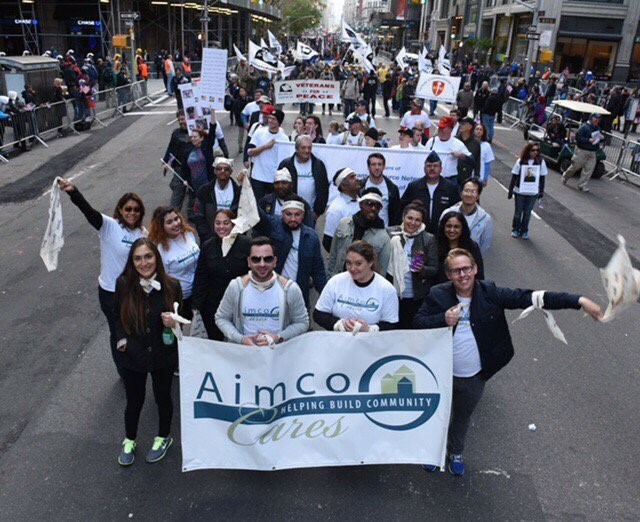 Second, Aimco sponsored a marching contingent in the New York City Veterans Day Parade. Gathering on 27th Street, Aimco employees joined over 20,000 marchers as it led the parade up Fifth Avenue. Aimco employees from all parts of the New York City Aimco operation joined together to support and celebrate New York City’s veterans, which is the country’s largest tribute to our nation’s veterans. Finally, Aimco donated gently used furniture to the CUNY’s PROVE program, the Project for Return and Opportunity in Veterans Education, which provides space and programming to student veterans managing the transition from service to higher education. Through these activities, Aimco has proven its genuine dedication to serving the communities in which it owns and operates. Aimco employees were able to bond over their shared commitment to service through their Veterans Day volunteering events, and the Capalino+Company team was thrilled to facilitate those opportunities. Part of Aimco’s core mission and philosophy is its commitment to being an outstanding corporate citizen. Aimco has a wide range of thoughtful CSR initiatives across the country, including a week of service each year in which employees get paid time to volunteer in their communities. For veterans, Aimco has given over one million dollars to the Tragedy Assistance Program for Survivors and Project Sanctuary, organizations that support veterans and their families. Outside of their commitment to veterans, Aimco also awards an Aimco Cares Opportunity Scholarship to low-income youth to pursue their educational goals. Over the years, they have given 147 scholarships worth over $825,000, and this year, five of those scholarships went to residents of the New York City Housing Authority (NYCHA). Capalino+Company is delighted to work with the Aimco team to develop a meaningful CSR portfolio in New York City. We applaud Aimco for its continued commitment to giving back. Contact Jeanne Mullgrav at Jeanne@capalino.com.